1. a. 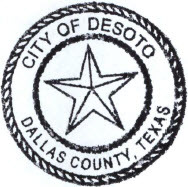 The Council will convene into Executive Session pursuant to Section 551.072 of the Texas Government Code to consider the following purchases of property within the City of DeSoto: Property generally located on Hampton Road and other property within the Hampton Road Corridor in the City of DeSoto. b. Action(s) as a result of Executive Session. 1. No items scheduled for this agenda. a place convenient and readily accessible to the general public as well as to the City's website www.desototexas.gov and said Notice was posted on the following date and time: Friday, September 28, 2018 by 5:00 P.M. and remained so posted at least two hours after said meeting was convened.